"Home for Christmas" is Cally Taylor’s second novel following her successful debut novel "Heaven Can Wait" (a supernatural romantic comedy). I haven’t read "Heaven Can Wait," but had come across Cally in writing magazines before. 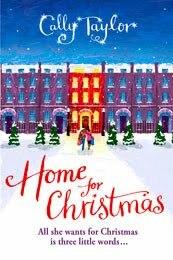 "Home for Christmas" has a lovely festive cover and is described as being ‘a sparkly seasonal tale of finding love at Christmas’. When I read the synopsis I wondered whether there would be much to this book, I thought the seemingly desperation of the character to hear those three words may mean it was a fickle read with a lead character that would niggle me. I’m pleased to say my worries were completely unfounded, there are some hilarious scenes associated with this will to hear these words and cling on to Aiden, it was a fantastic read from start to finish. This book has a dual narrative, alternating between Beth and Matt, I loved that we got to know each of these characters so well, they were so well rounded, both with their good and bad points, both self-reflective and ultimately very nice people! The comical moments between Beth and Matt start from the very first moment they meet, Beth is busy practising telling a cardboard cut-out of George Clooney she loves him when Matt first walks into the Picturebox..there are so many funny moments in this book it reminded me in a good way of how I felt when I read Bridget Jones. Beth’s best friend gets herself into some hilariously funny dating situations and Matt’s Granddad is utterly loveable! I laughed a lot and cried reading this novel, I found it to be a very easy book to get into and I read it within a couple of days, the pace was perfect and I didn’t want it to end. There are some cringe worthy moments with exes throughout this novel and for anyone who has struggled to accept a relationship is over you get to see both sides of the situation through Beth and Aiden’s relationship and Matt and Alice’s. I loved the fact it was set by the seaside (Brighton) and maybe would have liked to see a bit more of this reflected in the story. Maybe in the sequel?! Whilst I was content with the ending I would have liked to see an epilogue to find out a bit more about how things were going for the characters (even nasty Carl!) and the cinema a few months down the line. As for the ‘Christmas’ element, Christmas isn’t really integral to the story so I wouldn’t want anyone to be put off from reading this if they don’t celebrate Christmas or are avoiding anything related to Christmas in the New Year! I was impressed by Cally’s writing and found it really engaging yet seemingly effortless, I wouldn’t hesitate at all to pick up Cally’s other novel now. It might have been one of the last novel’s I’m reading in 2011 but it’s definitely in my top three of the year! For any budding writers out there, Cally also has some very useful recommendations and a short story tool on her website. I really loved this book too, it kept me up way past my bedtime for a few nights!